Immunoglobin (or antibody) means a protein that binds to the antigens in certain specific conditions. The antibodies are produced by our immune system as a result of specialised process, to help our body in fighting against various antigens including viruses and bacteria. 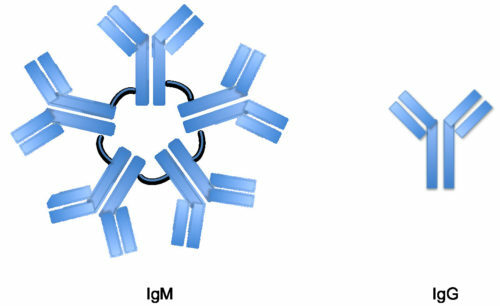 There are various classes of immunoglobulins including IgG and IgM. First we need to understand what they are in order to differentiate between IgM and IgG. Our body reacts differently to different types of antigens or disease agents. E.g. its response to chicken pox would be different from mononucleosis. However sometimes the body’s immune system might get mistaken and produce an antibody against its normal tissues, a condition called autoimmune disease. IgG and IgM are measured together usually to understand the functioning of immune system better. To understand the difference between both, let us first see them individually and get an idea of what they’re and how they work. IgM antibodies are produced by the body immediately after the exposure to the specific antigen. It’s the first antibody that our body produces as early as fetus stage. IgM is mainly found in blood and lymph fluid. It’s also the first antibody that’s produced in human body when it’s a foetus. IgM quantity produced upon exposure to the antigen is nearly 6 times as much of IgG. IgM antibodies usually also have 10 binding sites as compared to only 2 in IgG. However only about half of the binding sites can actually be used to bind IgM to an antigen. Because of multiple monomers bonded together, IgM is termed as being multivalent. IgM antibodies are temporary and disappear within 2 to 3 weeks following infection. IgG refers to an immunity for a particular disease. It’s a late stage response as compared to IgM. Immunoglobulin G or IgG, is an antibody that’s abundantly found in our body. It protects human body against various disease causing foreign agents such as viral attacks and bacterial infections. IgM antibodies are replaced by IgG antibodies that last for life time. This helps in providing long lasting immunity to that person for that specific disease and antigen. One of the most important difference between both antibodies is related to the time of exposure and time till the antibody remains in the body after the exposure. IgM is a short term response while IgG is a long term response antibody. For example, if some kid is exposed to chickenpox antigen, his blood IgM value will rise during the time immediately following the exposure and will go down once the infection is over. However that’s not the case with IgG. His body will develop IgG antibodies against this antigen and will acquire long term immunity against it due to the long term presence of IgG. Thus IgM indicates recent infection while IgG indicates both recent or past exposure to that specific disease antigen.